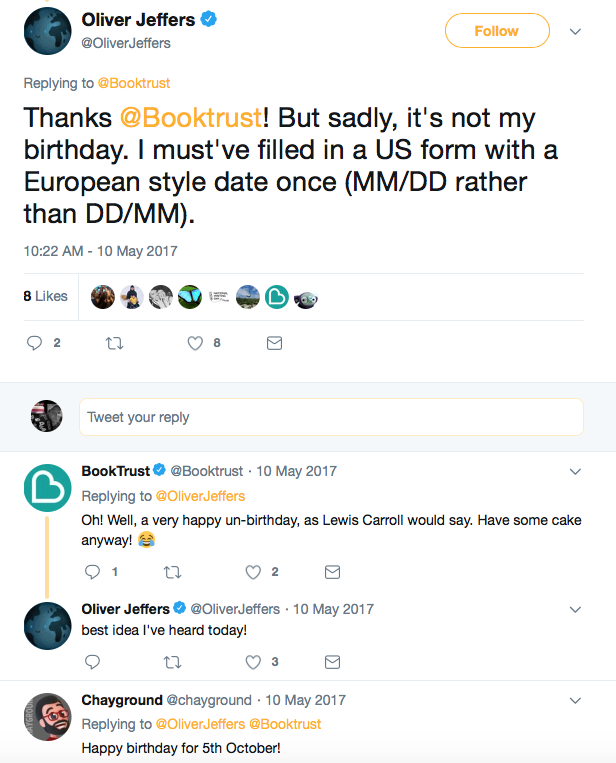 Note: For years, I posted the wrong birthday for Oliver Jeffers as May 10th. There was a miscommunication during a rainstorm in the autograph line at the National Book Festival. He signed our poster with his birthdate but I didn't note the European style date. MY APOLOGIES TO OLIVER FOR ALL THE BIRTHDAY WISHES in MAY!! 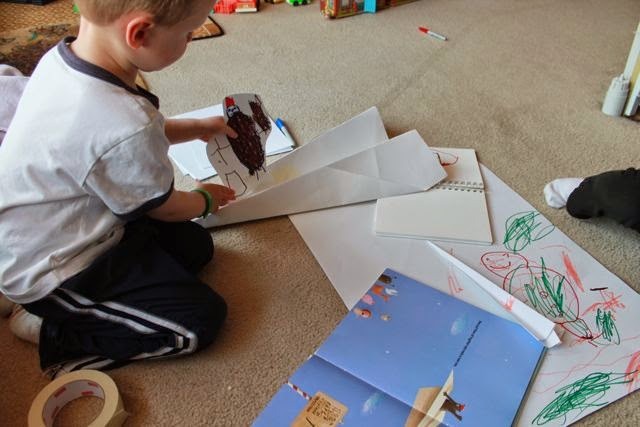 Do you have an all-time favorite picture book from your childhood? Do you recall why it is favorite and why it is so memorable? Was it the person who read it to you...was it the first book you read by yourself...or was the book just simply awesome all by itself. My six-year-old son has loved so many picture books including I Stink by Kate and Jim McMullan, DinoTrux by Chris Gall, and Robot Zot by Jon Scieszka and David Shannon. 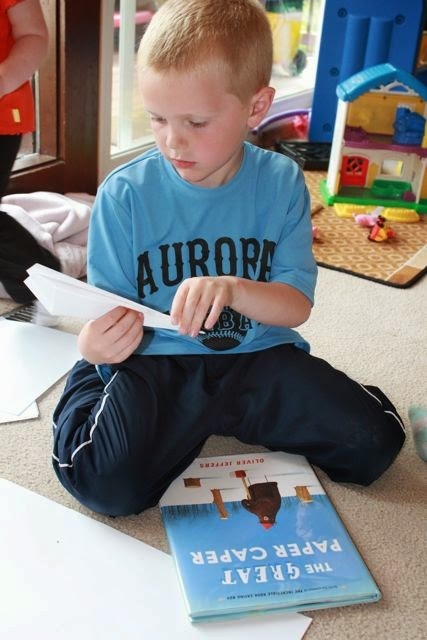 A few months ago I asked my son to come up with his Top Ten favorite picture books. I wasn't surprised that he couldn't stop at just ten and I wasn't surprised that The Incredible Book Eating Boy by Oliver Jeffers was the first book that he mentioned. When he first checked this book out from the library, I think we read it just about every night until it was time to return it. It is one of those books that is just simply awesome. 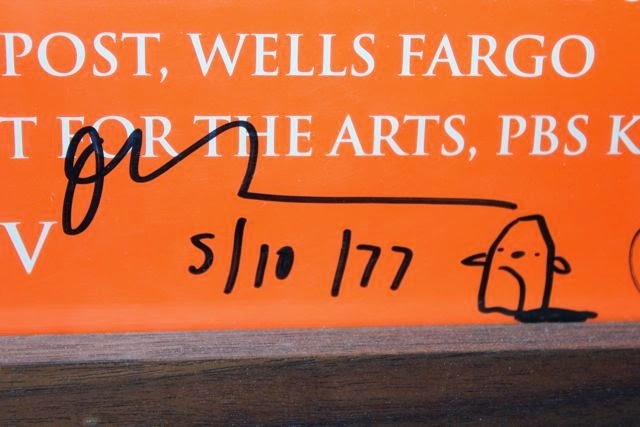 Imagine my son's excitement when he found out that we would be attending the National Book Festival and Oliver Jeffers was going to be there (this past September 2013)! To add to the excitement, we bought him his own copy of The Incredible Book Eating Boy for Oliver Jeffers to autograph. 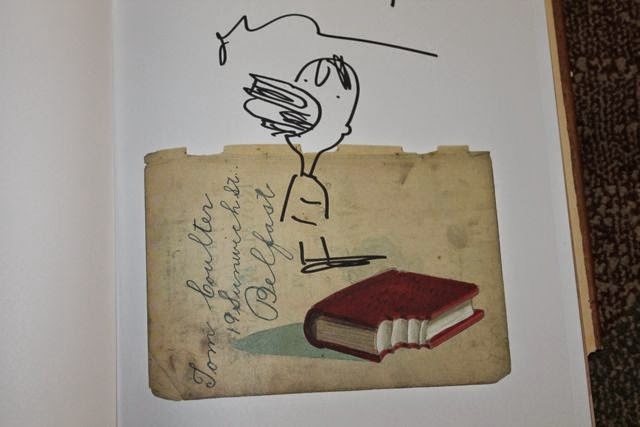 We were able to have Oliver Jeffers autograph it for him and he doodled Henry, The Incredible Book Eating Boy, too! The only unfortunate thing about the day was that it started pouring while we were in line to meet Oliver Jeffers! We were so worried about our books and posters getting wet that we didn't get a photograph! Thankfully, we remembered to ask him to share his birthday as he signed our poster! A little over a month ago, my son's school had Right to Read Week. Every day of the week there was a theme and a suggestion for a special attire. One of the days, the students were asked to dress like their favorite character from a book. 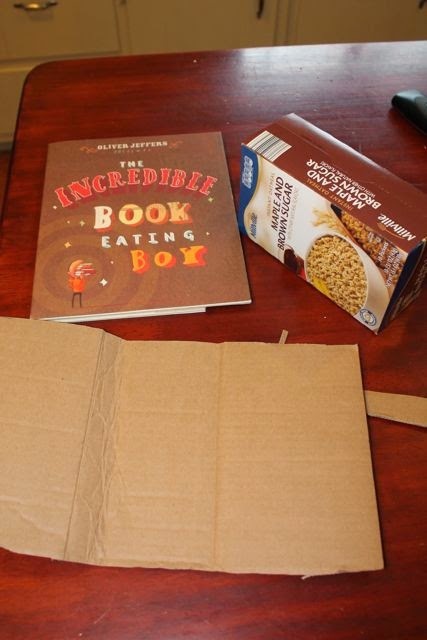 I wanted to figure out a way for my son to dress as Henry from The Incredible Book Eating Boy. 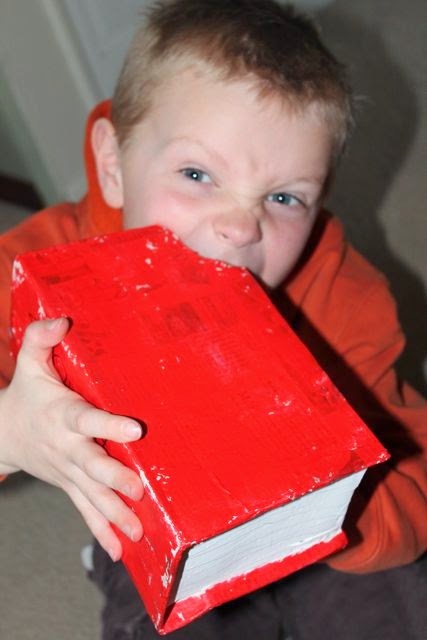 Henry eats books. It was something that just happened one day, and it started small; a word, then a sentence, pages, a whole book. Once Henry started to devour large amounts of books he realized that he was getting smarter. He was getting really smart until he ate too many books and got sick! His body couldn't cope with all the incoming words. Everything got mumbled jumbled. So he gave up eating books, but that doesn't mean he would entirely abandon books forever. We knew the story, but we needed a way to bring Henry to life. 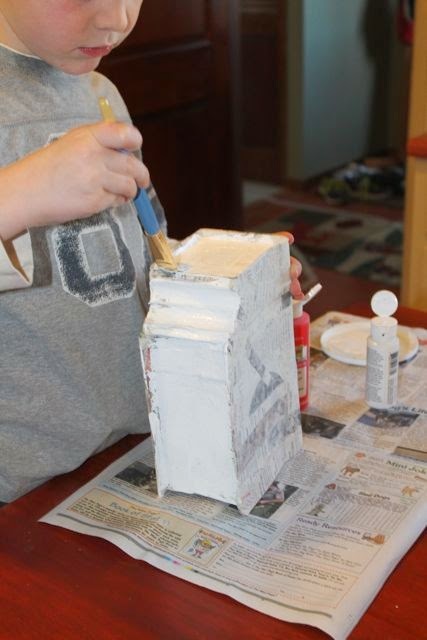 We decided to use papier-mache, one of our favorite mediums, to create a book that looked like Henry has just taken a huge bite out of it. 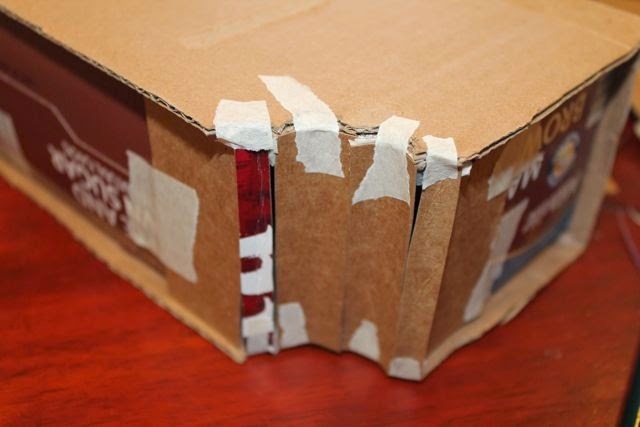 I started with a piece of cardboard and another cardboard box. 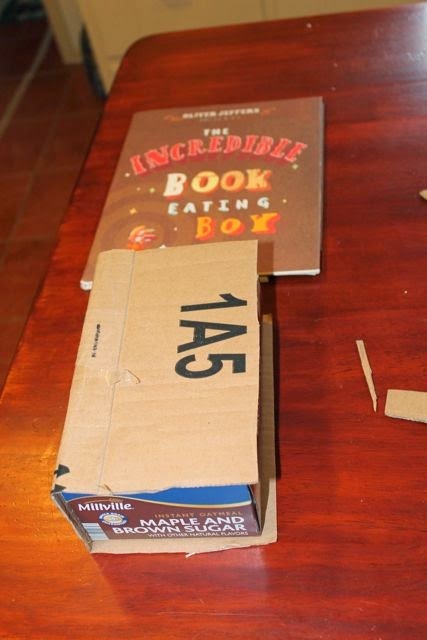 Then, I cut the cardboard to size and taped it around the box to create the cover of the book. The hardest part was creating the bite. I drew a bite mark in the corner. 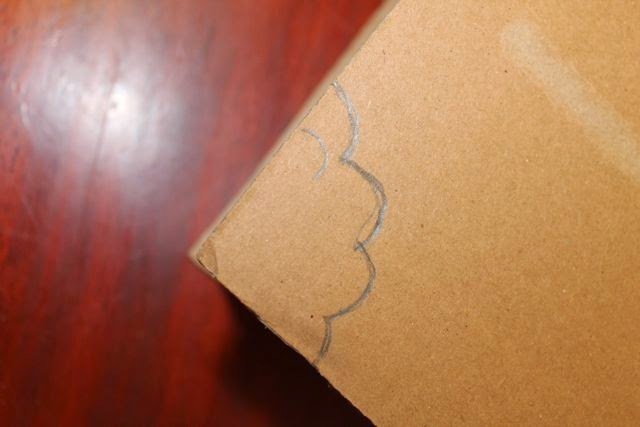 Then, I cut it out with an X-acto knife. 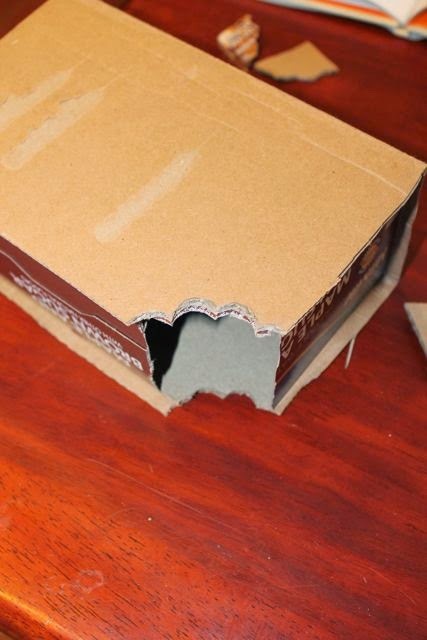 I then, filled in the opening with cardboard pieces. 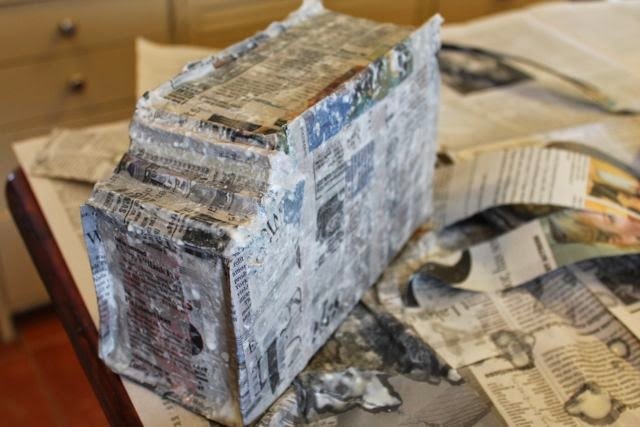 My son papier-mached the box with strips of newspaper. 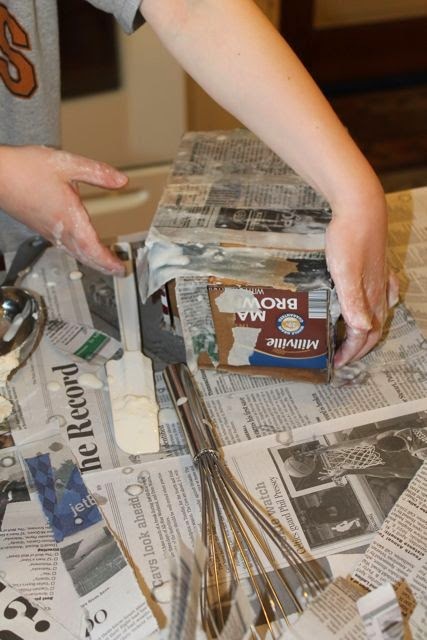 We used a flour and water mixture (2 parts flour, 1 part water, and a pinch of salt). We let the book dry overnight. The next day, he painted the pages white. 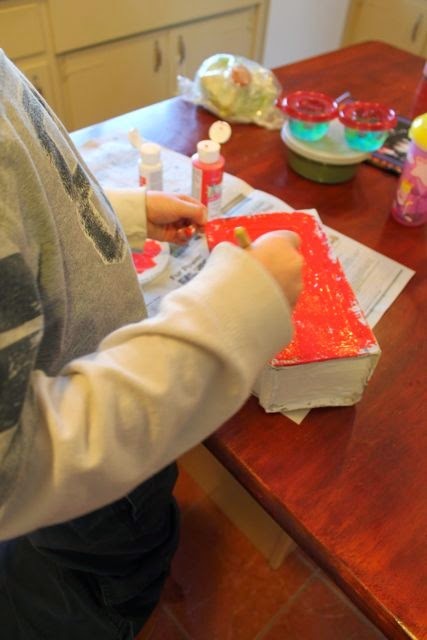 He chose to paint his book red. He wore orange and brown clothes like Henry in the book. 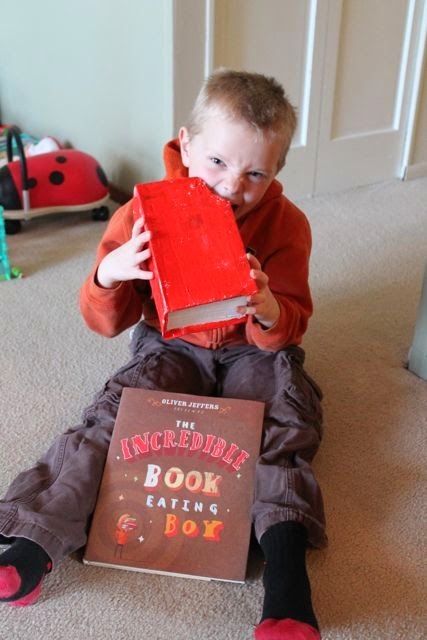 Now, this is an INCREDIBLE book eating boy! 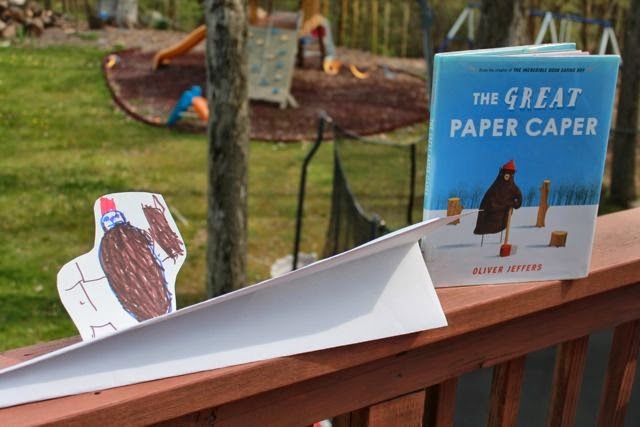 This week, we really enjoyed reading The Great Paper Caper, Oliver Jeffers' 5th picture book. It is mystery-like picture book about a group of animals in the forest that notice branches are suddenly missing from many of the trees. 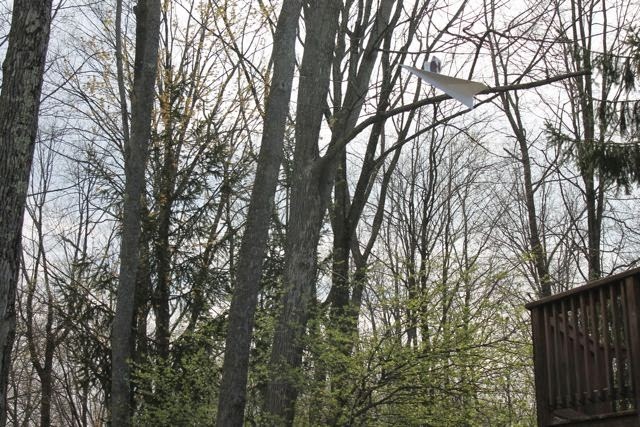 Soon, whole trees go missing. They launch an investigation that starts slow, but a moose leads them to look into the bear. 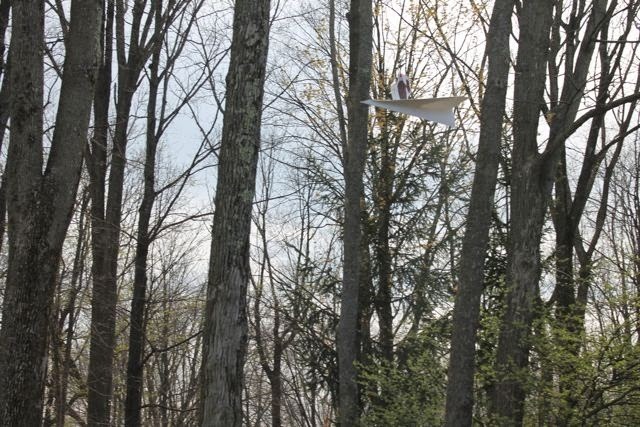 The police are notified, the bear is taken in for questioning and later admits to cutting down the trees to make paper for paper airplanes. 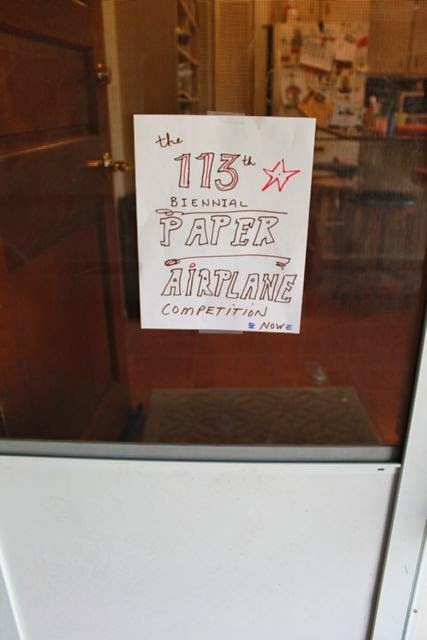 He was practicing (and it wasn't going well) for the 112th Biennial Paper Airplane Competition and he ran out of paper after many failed flights. The bear agrees to help grow new trees to make it up to the animals for cutting down so many trees in the forest. The animals were happy with how the bear handles the whole situation and decide to help bear accomplish what he was trying to do all along. 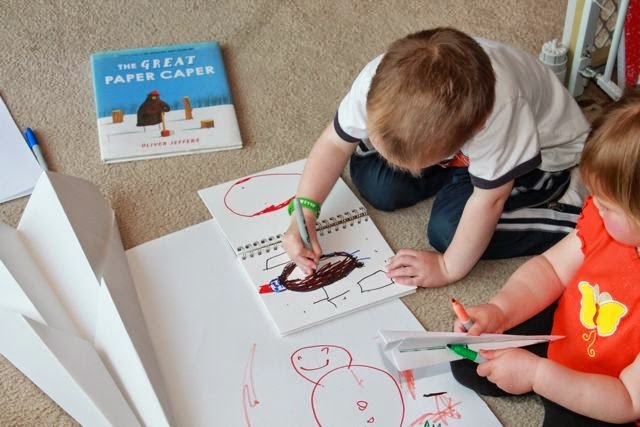 My youngest two children and I were waiting for my older two children to come home from school when I pulled out The Great Paper Caper and read it to them for a second time. My youngest daughter loved all the animals in the book, especially the beaver. 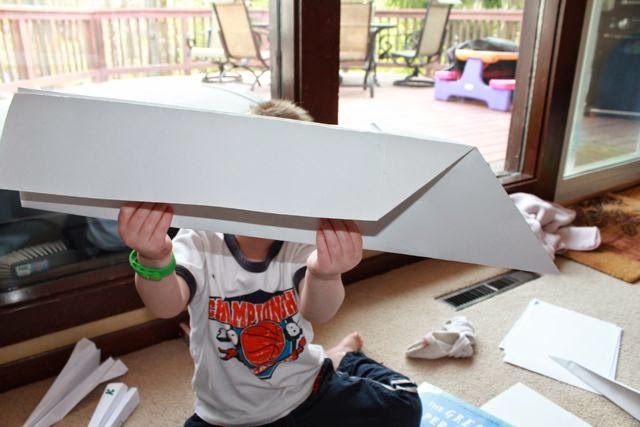 After reading the book, I made a huge paper airplane and asked my son to draw the bear so we could have him ride in it. 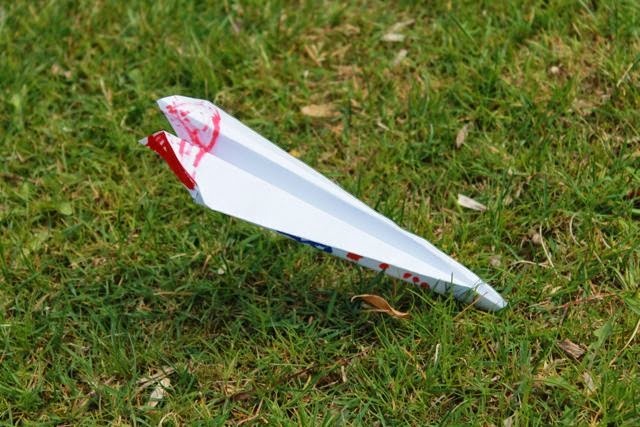 I made my daughter a paper airplane that she thought was pretty cool! 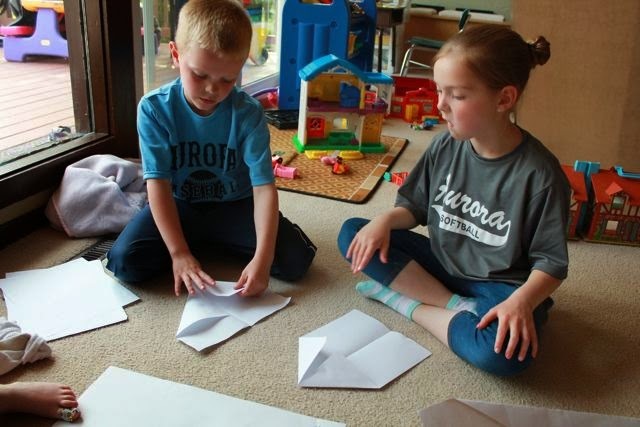 I told the little ones that when their brother and sister got home from school we would have a paper airplane competition. I placed this sign on the side door so that my older two children would see it when they came in the house. 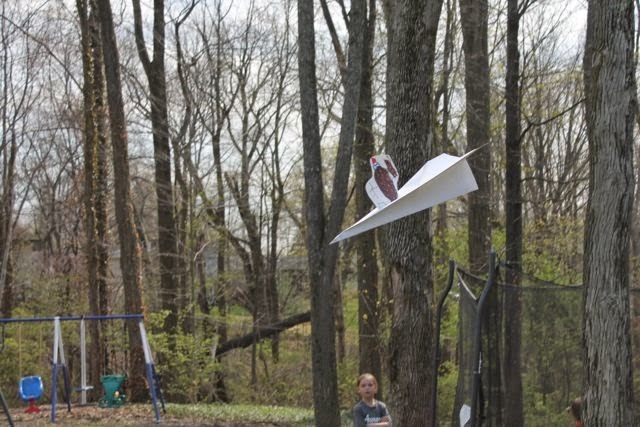 My son finished his bear and taped him inside the paper airplane to look just like the illustration from the book. 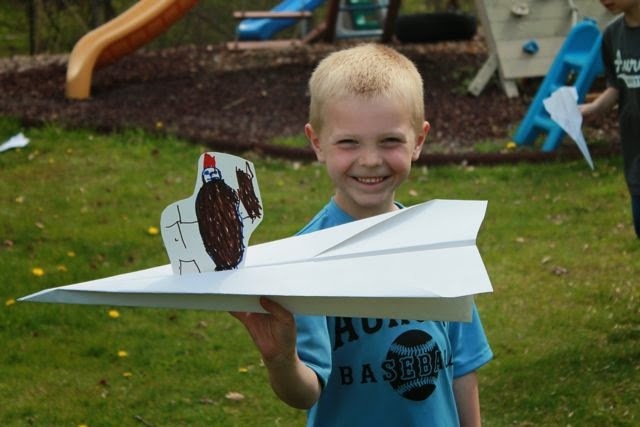 Also, my son made this airplane and called it his "Wiener-Dog Express". I guess he thought it looked like a wiener dog. 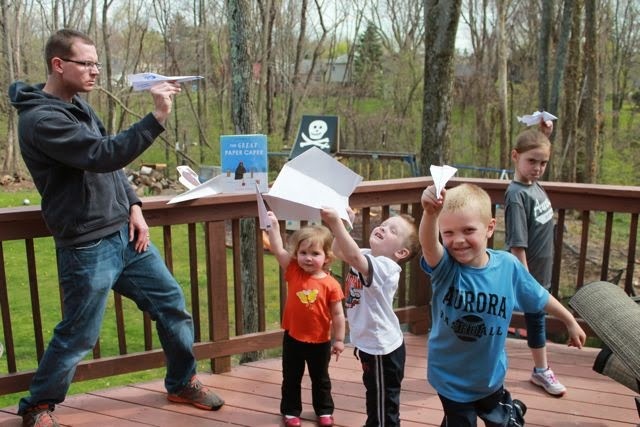 My big kids saw the sign and decided to make their paper airplanes right away. 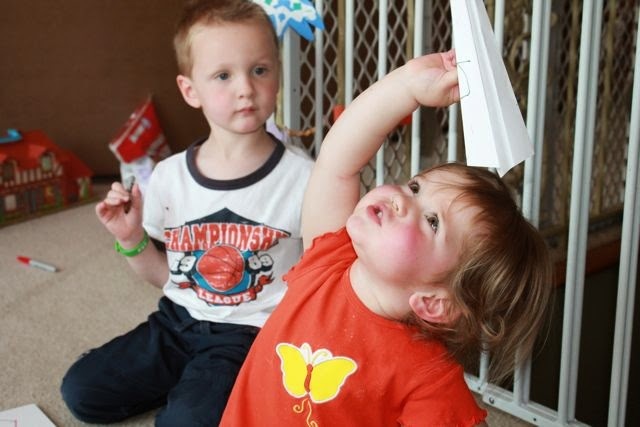 He wanted his airplane to be perfect. I love my son's bear drawing! Our game faces were on for the competition. 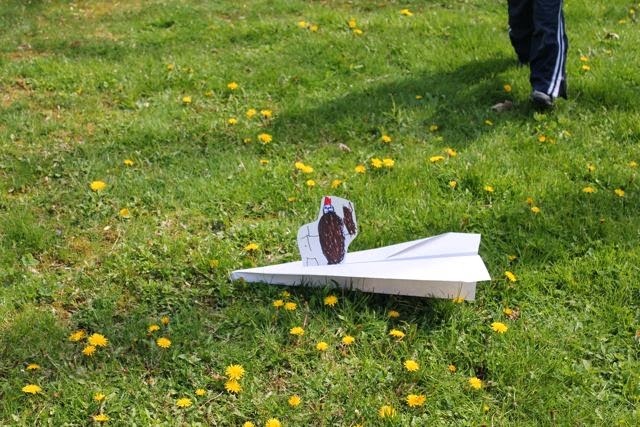 The Wiener-Gog Express takes flight! 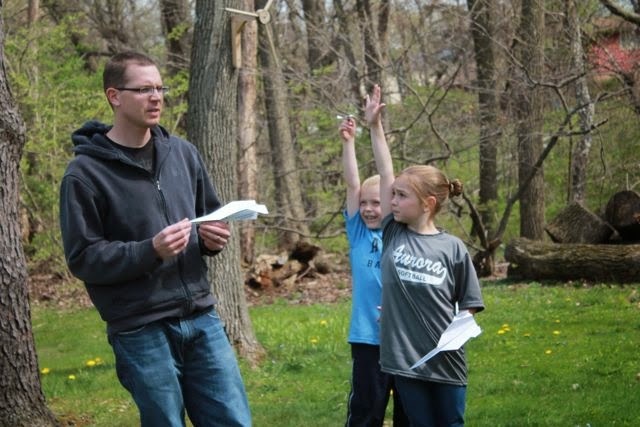 This paper airplane flew the farthest! 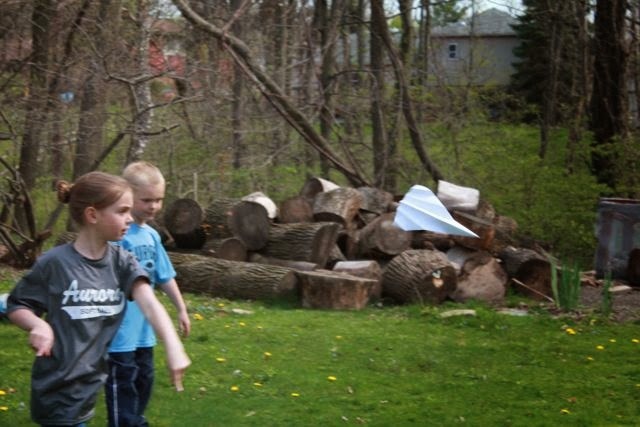 My daughter's paper airplane didn't fly the farthest, but it barrel-rolled the whole way which was really neat! It was time to give the bear the ride of his life. 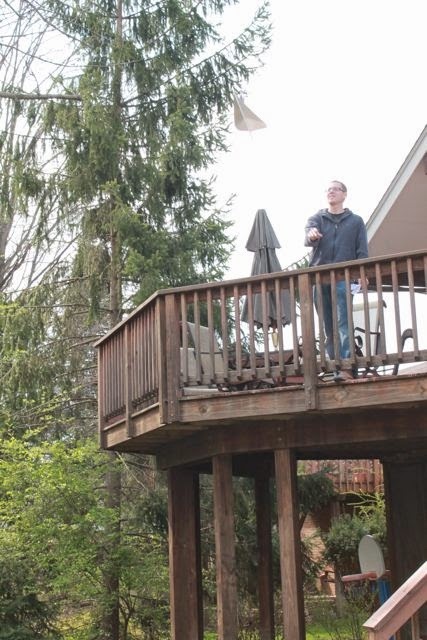 I went up to the deck and let him fly! 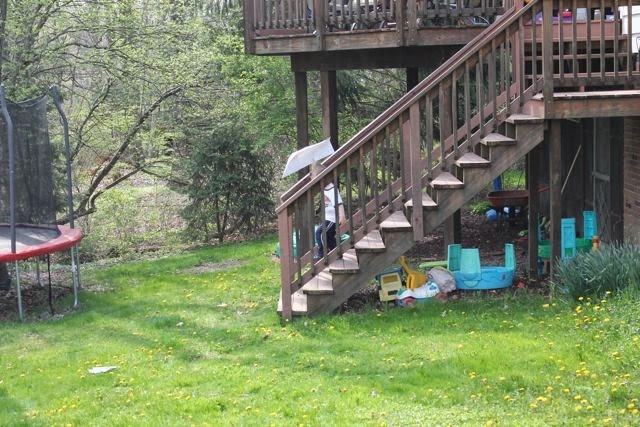 until he came to rest in the middle of the yard. Oh and the Wiener-dog Express was in flight once again and many times throughout the rest of the evening! 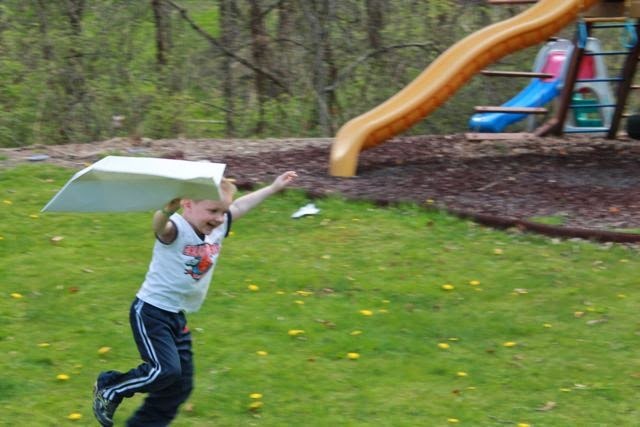 Before my son fell asleep that night he panicked. He said, "I think I left the Wiener-Dog Express outside. Can you get it? A raccoon might eat it!" We assured him that he did not leave it outside and that it was safe on the dining room table! 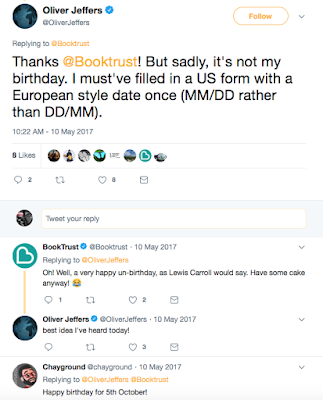 Thank you, Oliver for sharing your birthday with us and for signing our books at National Book Festival! We hope you have a fantastic day! 11. LOST AND FOUND film trailer - YouTube -- Click here to order the DVD on Amazon!